September 14, 1861. Based on a drawing by Captain Campbell Hardy. AGNS: 2009.135. 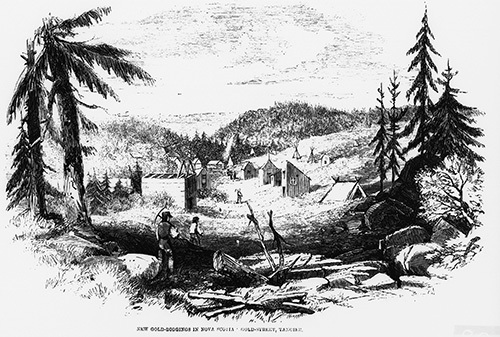 The Mi’kmaq knew about the presence of gold on the Nova Scotia landscape and settlers of the 1700s may have chipped away at chunks of quartz to get bits of the shiny mineral for their uses, but Captain L’Estrange, a British army officer, made the first officially documented discovery of gold in Nova Scotia in 1858 at Mooseland. Two years later, John Gerrish Pulsiver, with the help of his Mi’kmaq guides found gold in a quartz boulder in the same area of Mooseland. When he officially registered the find in Halifax, it ignited the first gold rush in Nova Scotia. People left their lives behind and came in droves to search for gold. For example, 600 men travelled to Tangier in 1861 to get rich quick. Further along the eastern shore that same year, Nelson Nickerson, a farmer from Sherbrooke, quietly discovered gold in his fields and tried to keep it a secret. His gold-fevered neighbours were suspicious and watched the Nickerson family closely for weeks. After hearing the sound of hammer on rock, over two hundred people converged on Sherbrooke, and a one-day search yielded over $400 in gold. That same amount of gold in recent times would be worth over $36,150. Knowing the trials and tribulations of the disorganized gold rushes in California and Australia, the Nova Scotia government scurried to instill order. 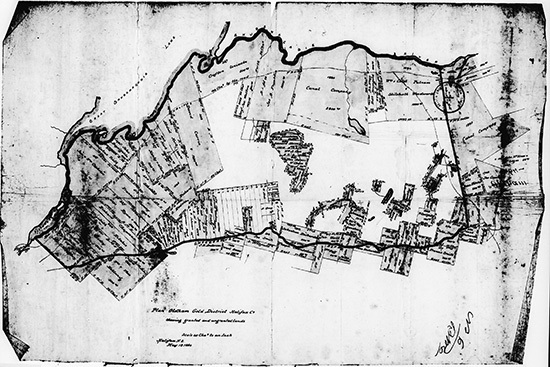 Sixty-four gold mining districts were set up from Stirling (just west of Sydney) Cape Breton, along the spine of Nova Scotia to Weymouth on its western shore. This meant that government surveyors laid out lots to discourage miners from digging pits too close together, which could result in collapse or flooding (at this time pits were mostly just holes in the ground). This was to try to control where pits were and to keep the peace among the prospectors. To be sure, gold was found and fortunes made, but many were disappointed because not being trained miners, they did not find gold. It is said that merchants made more money catering to prospectors, investors, and mining companies than the frenetic miners did digging. Between 1896 and 1942 there were two more rushes on the Nova Scotia goldfields. Compared to the frenzy of the first gold rush, the second and third were calm and methodical, yielding much more gold. Gold mining companies formed and claims by individuals dwindled. Rather than breaking rock apart by hand with a hammer, dynamite was introduced for blasting. Using mercury and cyanide to concentrate gold from ore and more efficient machinery further increased the gold yield.